Evernote is one of the most popular note taking app. It comes with lots of features and is available on different platforms. It allows you create text notes, voice tones and eve use Evernote’s Web Clipper tool to save entire article or a part of it in your notes. There is also a paid version of the app costing 4.99/month. If you didn’t like the pricing or you do not feel comfortable with Evernote, you should look for Evernote alternatives. 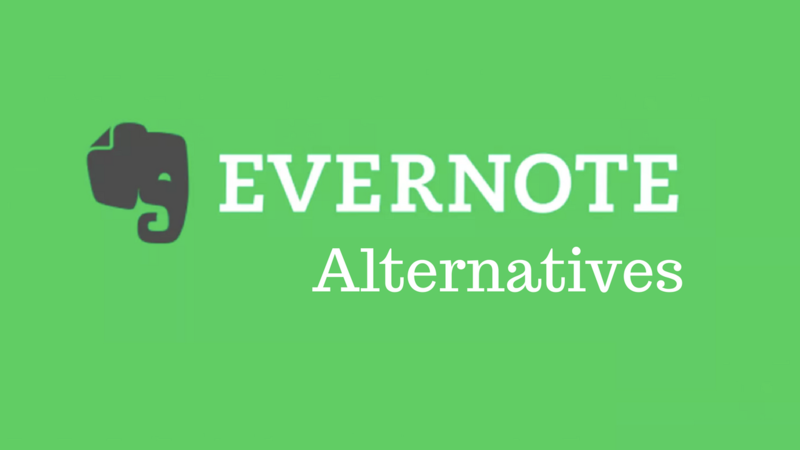 In this article, I am adding best Evernote alternatives you can try. We have already published a list of best note taking apps for Android. If you are using Android phone, you should look at that list to find best Evernote alternatives. Now have a look on the best Evernote Alternatives to keep your notes and access anytime. In this article, I am focusing on note taking apps of all the platforms. OneNote is the note taking app by Microsoft. It brings Evernote like features and allows you to keep text notes, voice notes, photos and more.It also has a web clipping tool similar to Evernote for saving web articles in notes. Just like Evernote, OneNote is also available on multiple platforms including Windows, macOS, Android, iOS, Web, Apple Watch, Android Wear and Chromebook. Availability on wearable platforms make it special. You can also collaborate on a same note and make a plan together. Another good thing is that it comes with deep integration of Microsoft office apps. If you are already using Evernote, you can use the importer tool to easily move your notes from Evernote to OneNote. If you are looking for a powerful Evernote alternatives, you must try OneNote once and you will not be disappointed. Google Keep is also a good note taking service available for Android, iOS, Chrome, Web platforms. It is similar to Evernote and allows you to easily save notes, reminders, create lists and more. You can also share the notes with other people and collaborate. You can also make list by voice. An important feature of this tool is that it comes with image recognition tech and can grab text from an image and make a note of it. So, you can scan any text and make a note out of it. It displays notes in the form of simple cards that look good and makes it easy to manage notes. You can also assign color code on notes for making search easier. You can also take hand-written notes. Simplenote is another good note taking app offering good experience. It comes with simple and easy to navigate layout. You can easily create text-notes, reminders, to-do list, and more. Like other services, it is also available on different platforms including Windows, Linux, MacOS, Android and iOS. All your notes will also be synchronised across all the platforms. The mobile app of the service is also very light weight and does not take much space of the device. It also allows you to share a list with others and collaborate on a list. This is totally free, so you should not forget to try that. This note taking app is from Automattic, the creator of popular blogging platform WordPress. Elephant is an open source nota taking app. It is basically available for Windows, macOS and Linux platforms. It has all those features that you find on Evernote. You can use to create notes, organise notes in notebook and syncs them across devices. The only missing feature of this service is that it does not support mobile devices. As the service is opensource, you ca full control over it. You can download it from Github. Zoho Notebook is one of the popular note taking app that you can see as Evernote alternatives. You can use to create text-notes, voice-notes, add pictures and more. All your notes will be available on all the devices as it syncs to the cloud and across your devices. It is ad-free service and available for free of cost. It also supports the multi-window editing feature in iPad. You can also add Google Keep like color coding of your notes. It also has a web clipper similar to what you had in Evernote. This web clipper allows you to clip a part of web page and make it a note. It is available for Web, macOS, Android and iOS platforms. Turtl is also a good alternative to Evernote. This tool is for those who care for their privacy. It encrypts all the notes created in Turtle app. When you signup, it uses your password to create a cryptographic key. This cryptographic key is used to encrypt your data. It claims that it never save password or key anywhere. The service is free but there is a data limit. While the company has not specified the limit, it is large enough to keep most of the your notes. It is also available on Windows, MacOS, Linux, Web and Android platforms.The iOS version of the app will come soon. TiddlyWiki is an opensource nota taking app for those who care for their privacy. This note taking apps offers encryption to keep your notes private. You also have option to keep your data just on your SD card or USB device if you do not want to to be upload on cloud. If you upload it to cloud, you can access it fro anywhere. You can also add a password on your notes to make it impossible for access by any other person. It allows you to take text notes, multimedia notes and audio notes. You can also organize notes with labels and colors. You can also add reminders and easily search for notes using the search bar. It also comes with lots of options for themes, Widgets and plugins to extend the functionality. You have plugins to move data from Evernote as well. TiddlyWiki is available for Windows, Mac, Linux and web. If you do not want access son mobile phones, you can try this one. In this article, I told you about best alternatives to Evernote. You have hosted services and open source services as well. Depending on choice, you can select any of the give. I personally use Google Keep and ZohoNote book. One for personal and one for business use. As all these services are free, you should try all these Evernote alternatives and see what suits you. If you know another good note taking app that is free and can be one of the best Evernote alternatives, you should comment below and let us know.